Happy Cowl knitting patternOur patterns are here! I feel like it's a small miracle since I've been thinking about them, designing them, knitting them, writing and photographing them over the last few months. I'm happy with our first collection of knitting patterns. The Happy Cowl pattern is beautiful and drapey because I took it up a few gauges and knit it on size 10 needles. Then I had tons of fun working on the Fair Isle colorwork on our Timber! Hat knitting pattern and of course our Fair Isle Friends wrist warmers, too! Timber! Hat knitting patternEwe Ewe Yarns are great for all sorts of projects. The fact that Wooly Worsted Washable is, well, washable means that you can use it for kids and baby knitting projects too. Our merino wool is super soft and the superwash means it's easy to care for. Just throw it in the washer, how great is that?! The Adoracole Cardigan & Hat knitting pattern would be a great handmade baby shower gift. Cute baby! Adoracole Cardigan & Hat knitting patternSo thank you for coming along on our exciting ride with our new pattern collection. We're so happy it's here! 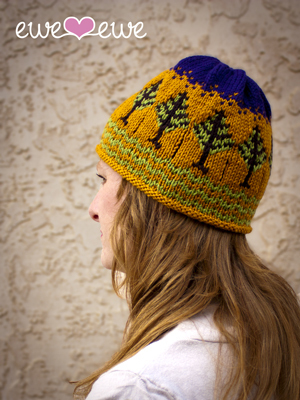 Stop by our pattern page to explore more, or find more specs on Ravelry. Happy knitting!